Health Legal was established in 2003 as a result of the health sector indicating it wanted a quality and competitively priced legal service that understood their environment and was able to focus exclusively on their unique needs. Health Legal’s team members are acknowledged leaders in the health and aged care sector, with Legal Counsel and Director, Natalie Franks, being annually selected for inclusion in the Best Lawyers list for Australia in the practice area of Health and Aged Care from 2008-2017. Natalie Franks has recently been announced the 2017 Best Lawyers’ “Lawyer of the Year” in the practice area of Health & Aged Care Law in Melbourne, as selected by her legal peers (published by The Best Lawyers of Australia). Only a single lawyer in each practice area in each community is given this honour. Health Legal has also recently been announced as the boutique winner of the 2016 Corporate Intl Magazine Global Award ‘Health Law – Law Firm of the Year in Australia’. 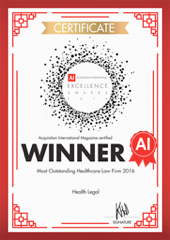 Health Legal was selected as Acquisition International’s ‘Most Outstanding Healthcare Law Firm’ for 2016 in the AI Global Excellence Awards. In 2012, Natalie Franks was also selected as Australia’s best Healthcare and Life Sciences lawyer in the International Law Office Client Choice Awards. Established in 2005, the ILO Client Choice Awards recognise those law firms and partners around the world that stand apart for the excellent client care they provide and the quality of their service. The criteria for the awards focus on law firms’ ability to add real value to their clients’ business above and beyond the other players in the market. The awards recognise the firms and individual partners that excel across the full spectrum of client service. Firms and partners were assessed on the following criteria: quality of legal advice, value for money, commercial awareness, effective communication, billing transparency, tailored fee structure, response time, sharing of expertise and use of technology.